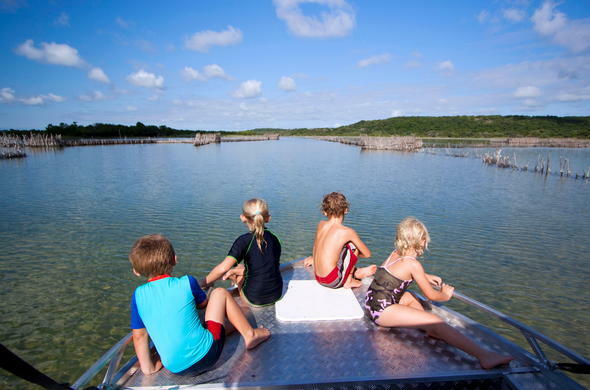 This wonderful nature reserve in KwaZulu-Natal offers excellent snorkelling and diving, Turtle tracking during summer, as well as activities like canoeing, boat trips and guided walks. On a KwaZulu-Natal holiday in the Kosi Bay Nature Reserve, guests can discover the estuary, lakes and forest on foot, in canoes, by boat and on day trips to nearby Big Five reserves. These guided adventures include turtle tracking on the beach and exciting game viewing at nearby Tembe Elephant Park. Explore the wonderful underwater world at this KwaZulu-Natal nature reserve in South Africa. Kosi Bay is one of the best diving sites in South Africa with beautiful coral reefs and colourful fish in crystal clear water. Try scuba diving on the reefs or snorkel in the shallow estuary at the Kosi Bay River mouth. Turtle tracking is offered every night from 15 November to 15 January. These excursions can last up to 3-4 hours and you may return very late. Giant Leatherback and Loggerhead Turtles make their way up the beach to lay their eggs. Guests are afforded the chance to view these fascinating creatures’ mere metres from where she is laying her eggs. A highlight of your KwaZulu-Natal holiday has got to be the canoe trip on the Kosi Lakes. Here guests will get the opportunity to canoe along the Sihadla channel and admire the spectacular Raffia Palms. Birding enthusiasts will enjoy a rewarding birding experience. You are always accompanied by a guide and will be included in stays of one night. The Kosi Lake system is a series of interconnected lakes stretching over some 18 kilometres. The best way to experience the system is by boat. If you are camping or staying in the chalets you will need to bring your own boat. Kosi Lodge offers exciting boat trips through the various lakes and channels, including a walk through the famous Kosi Bay fish traps. Guests will also enjoy a wonderful picnic lunch and a swim in the sea at Bhanga Nek. This activity is included to guests staying more than 2 nights. Guests staying at the Kosi Lodge can enjoy a full day excursion to the stunning Kosi Bay Mouth. It is here that the sea and lakes interconnect in a beautiful swirl of colour, sand and water. This is also a great place for year round snorkelling, as the water is warm, crystal clear and is home to an abundance of fish. Guests can enjoy swimming in the warm waters or simply enjoy the sun along the powder white beach, followed by a lovely picnic. Enjoy early morning or late afternoon guided walks through the magnificent Raffia Palm Forest during a KwaZulu-Natal holiday. Keep your ears peeled for the harmonious sounds of birds, and perhaps catch a glimpse of the rare palm.nut vulture. The Raffia Palm is the largest palm in the world. Tembe Elephant Park is just an hour away from the Kosi Nature Reserve and visitors can enjoy exciting game viewing on 30 000 hectares of prime wilderness. Enjoy brilliant Elephant viewing from the game hides at this reserve in KwaZulu-Natal, South Africa. Explore the beauty of the Kosi Lake system on horseback, enjoying lovely views of the sparkling KwaZulu-Natal beaches in Kosi Bay and sightings of Hippos lazing around in the water. Explore this unique water wonderland by canoe or head for the Kosi Bay beach and discover this prime eco-tourist destination. Snorkelling is good all year round and the water is almost always crystal clear. Kosi Forest Lodge provides snorkeling equipment. Fly-fishing can be very rewarding along the coast and in the lakes.